On August 6, 1945, when the Enola Gay's bombardier Tom Ferebee sighted Hiroshima's Aioi Bridge, he knew the moment had arrived. Squeezing the trigger on his Norden bombsight, he became the first man in history to drop a nuclear weapon upon a populated city. Tail gunner Bob Caron, after being temporarily blinded, described what he saw on the ground below: "It's like bubbling molasses down there... the mushroom is spreading out... fires are springing up everywhere... it's like a peep into hell." 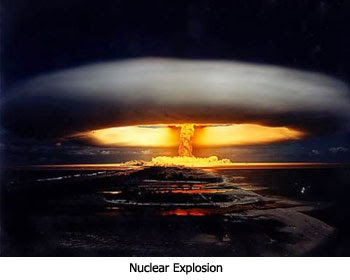 Since the beginning of the atomic age, nuclear weapons and the term "Armageddon" have been frequently linked together. Billy Graham rose to prominence in the 1950's proclaiming that the nuclear "sword of Damocles" was hanging over all the nations, and that only Christ was a sure foundation in such perilous days. Hal Lindsey"s mega best seller, The Late Great Planet Earth (1970), made a strong case for a nuclear holocaust scenario in the days of tribulation predicted in the book of Revelation. Many Americans associate nuclear weapons with Armageddon, because, of all man's discoveries and inventions, they alone contain the capacity to wipe out all human life on the earth within a few short hours. Let us consider the awesome power in the first primitive atomic bombs. "I climbed Hikiyama Hill and looked down. I saw that Hiroshima had disappeared... I was shocked by the sight... I saw many dreadful scenes after that — but that experience, looking down and finding nothing left of Hiroshima was so shocking that I simply can't express what I felt... Hiroshima didn't exist — that was mainly what I saw — Hiroshima just didn't exist." After the end of World War II, Robert Oppenheimer, the director of the Los Alamos project which had given birth to this terrible weapon, was asked whether there were any significant limitations in the future of nuclear weapons. He replied, "If you are asking, 'Can we make them more terrible?' the answer is yes. If you are asking, 'Can we make lots more of them?' the answer is yes. If you are asking, 'Can we make them terribly more terrible?' the answer is, probably." Today, some fifty years later, that probably has turned into a certainty. We have made them terribly more terrible. Considering the horrific devastation caused by those first bombs dropped upon Japan, it would be reasonable to suggest that if we merely doubled their destructive power we would have created a monster of mind boggling dimensions. To triple or quadruple such a bomb would be worse still. If one such bomb can create such total destruction to a major city, what could a bomb four times that size do? But we have not merely created weapons three or four times as deadly. 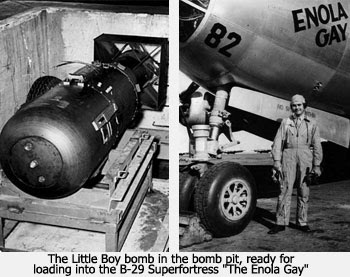 While the "Little Boy" and "Fat Man" bombs were measured in kilotons, today's bombs are measured in megatons. A one megaton bomb contains the explosive power of eighty Hiroshimas. Bombs have been tested which are 4,000 times as powerful as those dropped upon Japan. The only thing merciful about these bombs is that you wouldn't have to worry so much about horrible injuries to survivors — there wouldn't be any survivors! Nearly two thousand years ago, an elderly Christian leader was banished to an island as a punishment for sharing his faith in Christ. There, as he communed with the Lord on the island, he had a series of visions which described things which would take place in the last days. The man's name was John and the visions he saw were recorded and are now known as the book of Revelation. Many have tried to defuse the book by turning it into a giant parable in which nothing can be definitely known except that in the end Christ will triumph and all will be well. But such an interpretation makes all the details of the visions meaningless. Some have dared to suggest that John's visions may have been more literal than most have supposed. This more literalistic interpretation just might make sense if John was seeing the terrible results of a nuclear holocaust just before Christ's coming to claim planet earth. "Although it is possible for God to supernaturally pull off every miracle in the Book of Revelation and use totally unheard of means to do it, I personally believe that all the enormous ecological catastrophes described in this chapter (Revelation 8) are the direct result of nuclear weapons. In actuality, man inflicts these judgments on himself. God simply steps back and removes His restraining influence from man, allowing him to do what comes naturally out of his sinful nature. In fact, if the Book of Revelation had never been written, we might well predict these very catastrophes within fifty years or less!"